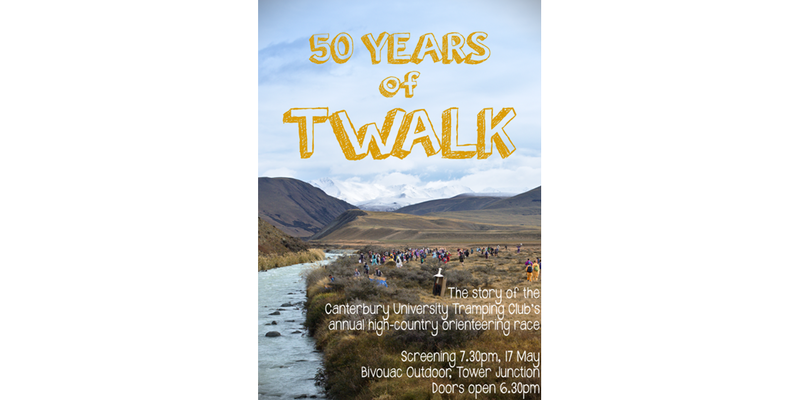 The documentary is an hour-long film about TWALK, the Canterbury University Tramping Club’s notorious annual orienteering event which has been held in the Canterbury high country since its beginnings in 1967. This year marks the 50th year that TWALK has been held, and the documentary features some stunning footage from recent and past events as well as interviews with TWALK veterans who have been competing since the event was in its infancy. It’s likely some of you may have entered TWALK, either during your uni days or perhaps more recently. Some orienteers may even have cameo appearances in the film. Tickets will be available on the night, or in advance from Bivouac Outdoor at Tower Junction Christchurch. Entry is $5, or $2 for current CUTC members, and includes complementary drinks and nibbles, and Bivouac will also be offering some good store discounts. Doors open from 6:30 pm. If you’d like any more information get in touch with hello@twalk50.org.nz, or have a look at the website http://twalk50.org.nz. After the screening, copies of the documentary will be available for download from Vimeo, and we will take orders for DVDs and Blu-ray. Bivouac Outdoor, Tower Junction, Christchurch. 17th of May at 7:30 pm. Filmed and produced by Tobi Wulff.